Back in April 2010 we discussed the new paid for models being proposed for Twitter, under the blog title Twitter Simplifies it's Business Model - #not. We are talking about this now, as a client recently enquired about the differences between the Twitter advertising models, as is potentially interested in promoted accounts. The Promoted accounts model on twitter allow brands to gain more followers by being placed within the "who to follow" section which appears on right hand bar. The news of the launch of promoted accounts didn't go down well in New Media circles and many looked at it as shameful that brands would pay for followers. Due to this we haven't pushed promoted accounts to our clients, as in our opinion, what brands need to do first is write useful and interesting tweets and gain credibility from engagement with others. Then in the future when they have reached a plateau of engagement and created the buzz, well then they can move onto paying for a few more followers...maybe. It is a concern that asking for followers could cheapen a brand, or indeed make them look slightly desperate. Alas, we have ourselves been turned around recently and have found ourselves clicking on a few promoted accounts that appear in the side bar. Twitters computer rules /algorithms of finding a twitter account you would like, seems to work well for us @rocktimesocial. We are still very sceptical of promoted trends and tweets, and currently monitoring case studies of people using these methods of advertising. We are aware that the majority of people see Twitter as a closed experience and are not jumping up and down with glee with the ads right now, even the Twitter Sales Rep on this 40 minute video (35 mins in) from All Things Digital states to be aware that some people may not like the ads and to take note that it they don't like them that they will be vocal about it. It is this backlash that concerns us, as unlike Paid Search in the content networks or Facebook advertisements, these ads are realtime and the promoted tweets will be in your feed (rather than side bar). Thus on starting a promoted tweet campaigns, please do make sure you have the resource to deal with any nasty, back off with your advertising @ mentions. Working on our client's social media portals, we do have a lot of insight per client on what messages go down well with their audience groups so we can advise appropriately. In summary any type of successful promotion campaign needs to be focused on goals, be planned / strategised and integrated to a wider plan. Fiona (at Rocktime) has found a great example of integrated approach using promoted ads on Twitter, she will be sharing with you next month.. so remember to visit back. Twitter looks at your account and followers to identify similar accounts and similar followers. 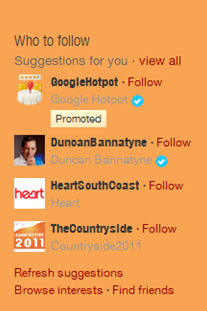 You then appear in the Suggestions of Who to Follow. If you would like to find out more about advertising within the social networks, please contact the Flashlight Search Marketing team. Earlier this month Twitter reported that we'll be able to see promoted tweets rolling out in the UK next month. Promoted tweets, trends and accounts are already available in the US, and it's been suggested that companies such as O2, Vodafone, Sky and Sony will be the first to take advantage of these in the UK.